While we sit back and wait for the streetcars to arrive, another form of inter-neighborhood transport will be coming sooner. Sooner, as in a few weeks from now. 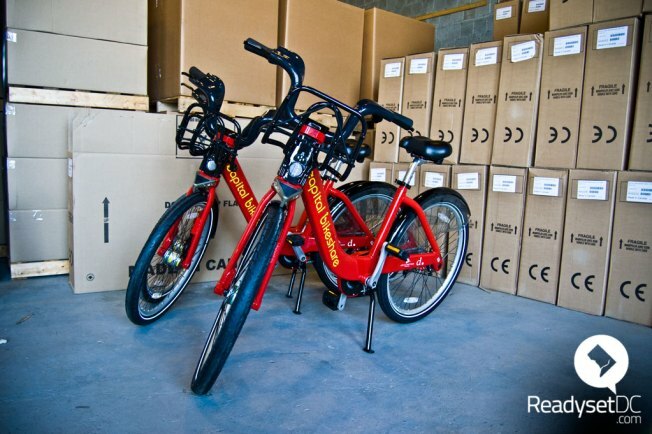 Capital Bikeshare will launch in September with 100 locations and more than 1,000 bikes in D.C. and Arlington. The first bikeshare stations were installed today in Arlington. Mid-September is the goal for all stations to be installed and programmed. ReadysetDC will be documenting this progress. We received a tour, led by Alison Cohen, of the assembly warehouse of Alta Bicycle Share, the company that is assembling and installing Capital Bikeshare, located near the riverfront in Southwest. Above: Alta’s current office. Below: Alison Cohen on one of the brand-new bikes. Above: One of the bike docks up close. Below: Lots of docks. Above: Station kiosk getting decals applied. Each bike is assembled here. Next to the warehouse is the yard. The photo below shows one day of production. Lots and lots of station maps. Each one has it’s location labeled. One side will show the entire system map, and the other will have a local map for each location. For more information on Capital Bikeshare, or to get a membership, visit www.capitalbikeshare.com.